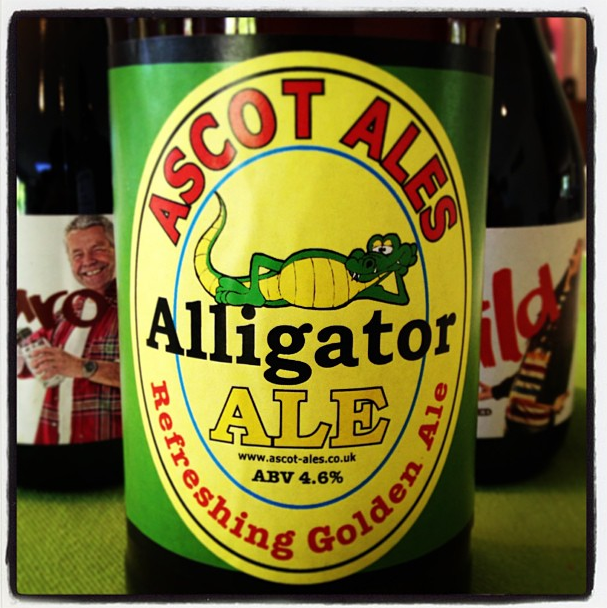 I tried quite a few of Ascot Ales beers at the recent Surrey county show. There were some very interesting brews on offer – including a very rich and strong imperial stout. However it was a lovely sunny warm day and the Alligator Golden Ale seemed to be the most appropriate and refreshing beer at their stand. I bought a couple and they’ve sat in the fridge for a few days now. On pouring there are lovely “English pub” aromas – the beer has a small head that clears very quickly into nothing. The colour is orange and amber similar to most golden ales. It is a little bit cloudy – but there is sediment in the bottle – and I have stored it on it’s side in the fridge and poured every single drop from the bottle! I’m not too bothered by this. It’s not a polished beer or a professionally produced filtered clean beer – but it’s a beer that makes you proud to be British and a beer that makes you excited by what the small guys can produce!